LaCie in collaboration with Porsche has come up with another new set of portable hard drives, the LaCie Porsche Slim USB 3.0 hard drive. LaCie has been producing USB 3.0 portable hard drive such as the LaCie P9220 but this time they have gone a step ahead in producing a very slim portable hard drive measuring just 11mm in thickness. According to LaCie, the Porsche Slim USB 3.0 hard drive has a very durable aluminum body and has a built-in 256-bit hardware encryption for added security for your stored data. 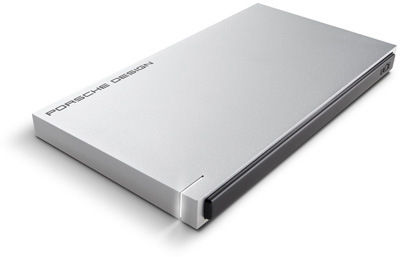 The LaCie Porsche Slim will be made available in 500GB size and will start shipping by the end of May 2013. At the time of writing there was no news on retail price and availability market. LaCie Porsche has started shipping, see details.